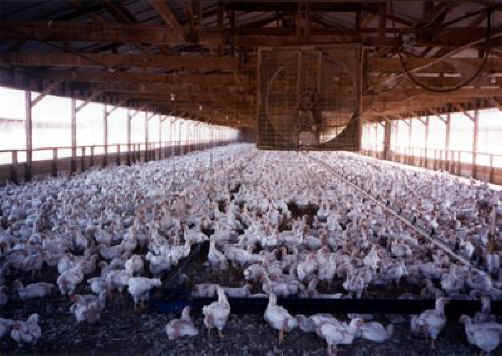 (Chicken Exploitation - Broiler Meat Production - 02) This is another view of chickens who are raised for meat being crowded by the thousands in "grower houses." Approximately nine billion chickens like these are slaughtered every year in the U. S.. They are being deprived of their God-given liberty for their entire lives. This is evil! The Bible teaches us that we are to "rule" over the animals in the same way we expect our elected government officials to "rule" over us.